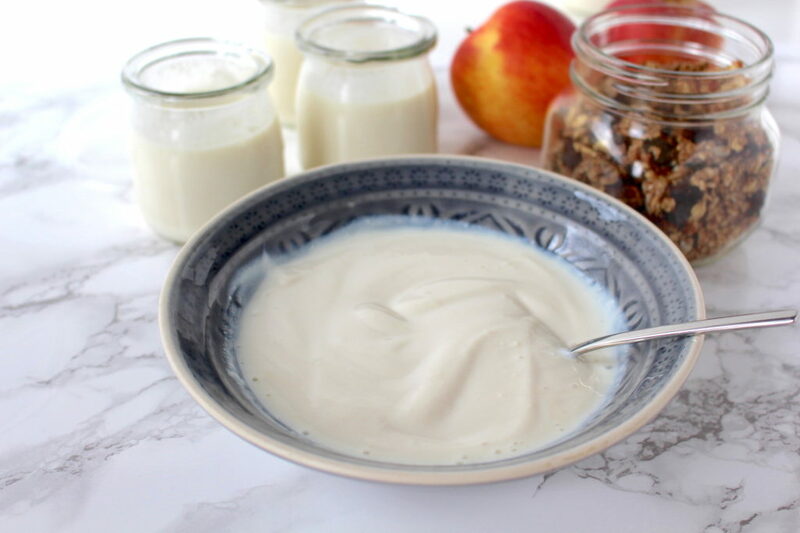 With this basic recipe, you can make vegan yoghurt yourself to save money and packaging waste. You don’t necessarily need a yoghurt maker to make yoghurt at home. By now you can get all kinds of vegan yoghurt in any grocery store – from coconut via soy through to almond yoghurt, there’s something for everyone. So why even bother making it yourself? Making your own yoghurt, you can save money and packaging waste, which btw often isn’t recycled correctly, for good. Plus, you get to choose the ingredients, like the kind of sweetener and you can customize the taste to your liking. 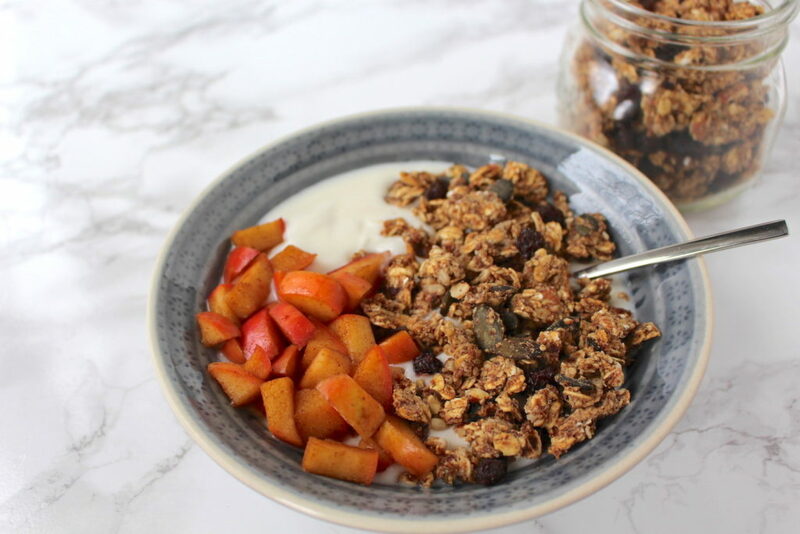 I love eating yoghurt with this oil-free and date sweetened granola and some fresh fruit. 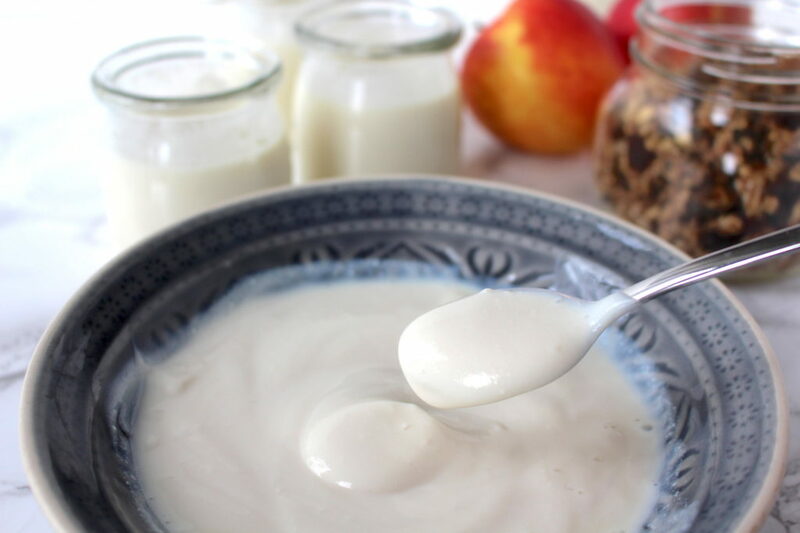 To make creamy yoghurt from plant-based milk, you need to add bacteria culture to it. To activate these cultures, you have to heat the milk to body temperature first and then keep a temperature of about 105° F (40° C) consistently for 8-10 hours. This works best with a yoghurt-maker, as it takes care of temperature monitoring for however long you set it. However, you don’t need this kitchen gadget, as yoghurt has been made for thousands of years without one already. Yoghurt-maker: this is the easiest method, as the machine takes care of temperature monitoring itself. This purchase makes sense if you eat yoghurt quit a lot and want to make it yourself regularly in the future. I just got a cheap one and I’m pretty happy with it so far. Oven-method: preheat your oven to 120° F (50° C), place glas containers with yoghurt in the oven and turn it off after 10 minutes. Keep containers in the oven for 8-10 hours. On very warm days, you can leave containers wrapped in towels in the sun for some hours. Next to or on a heater, which is set to a temperature at which you can still touch it without burning your fingers. 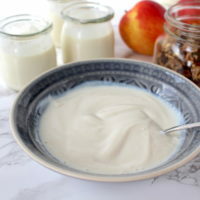 The basic recipe for vegan yoghurt isn’t any different from the one for conventional yoghurt: add yoghurt cultures (from a store-bought yoghurt or yoghurt powder) to milk and keep warm for 8-10 hours. 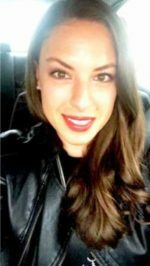 You’ll find some tips and different methods in the notes section. Put milk in a pan on the stove and heat until it reaches body temperature (about 105° F / 40° C). Check the temperature with your fingers/ back of your hand or by using a kitchen thermometer. If using agar agar or homemade milk: bring milk to a boil (then add agar agar) and let cool to body temperature before proceeding. Add yoghurt (or yoghurt powder) and pour milk into glas containers or the chosen container for the oven etc. (s. notes). Depending on the method, either set the yoghurt maker to 108° F (42° C) and 8 hours or place in preheated oven/ underneath blanket etc. (s. notes). After 8 hours, check for firmness and add thickening agent (guar- or carob gum, s. notes), if necessary. Now you can also add flavor like vanilla or sweeteners like maple syrup. Serve right away or let set in the fridge for 1-2 hours. Soy milk works great to make yoghurt as it contains a lot of protein. Oat milk, on the other hand, doesn’t work at all. If using homemade milk, be sure to bring it to a boil (before bringing it to body temperature and then adding the cultures) again for extended shelf life. You could also use yoghurt powder, which you might get at a health food store/ pharmacy or online) – I haven’t tried that yet, so I can’t speak from experience. If using agar agar as a thickening agent (e.g. if you make yoghurt with coconut milk), you need to bring the milk to a boil and mix it in before letting it cool again and adding the cultures. To make the yoghurt firmer afterwards, you can add guar- or carob gum. For my taste, this isn’t necessary if you make yoghurt with soy milk, though. I hope you love this recipe – please let me know in the comment section below! If you make this vegan yoghurt, make sure to take a photo and share it on my Facebook page or on Instagram, using the hashtag #minamadefood. Oh and don’t forget to tag me (@thisisminamade) so that I can see your creations!